MAGNETIC HILL : Defying the Law of gravity. This place is close to the Gurdwara Shri Patthar Sahib. It has been noticed that when a vehicle is parked on neutral gear on this metallic road the vehicle slides up-hill that's the Believe it or not of Ladakh. GURDWARA SHRI PATTHAR SAHIB: The Shrine known as Gurdwara Patthar sahib is situated about 25 kms. Short of Leh town on the Leh-Srinagar road. Built in the everlasting memory of Shri Guru Nanak Deve Ji the great prophet who sanctified the place by his sacred visit during the year 1517 while on his second missionary tour (2nd Udassi 1515-1518). The Guru reached here via Nepal, Sikkim, Tibet Yarkand and Leh after having spiritual discourses with the sidhas at Mount Sumer (Central Himalayas). On the hill features across the road, there used to live a wicked demon that terrorized the people of the area. Their miseries multiplied day by day. As their miseries became unbearable they prayed for divine help. It is said that the Great Guru heard their woes and came to their rescue. The Guru settled down on the bank of the river flowing nearby. The people sought for help and the Guru blessed the people and became very popular in the area. The locals called him as Nanak Lama. The Demon got enraged and started making plans to kill Guru Nanak. One morning, when the Guru was sitting in meditation, he rolled down a big boulder from the hilltop with the aim of killing the Guru. But on the very touch of Guru's body, the solid rock melted like wax and Guru's back got embedded on it like a cushion. The Guru kept on sitting in meditation undisturbed. Thinking that the Guru must have been killed, the demon came down but was taken aback on seeing the Guru in meditation, undisturbed. With a rage of anger he tried to push the rock with his right foot but the rock had already became like wax his foot also got embedded into it. On this, he realized his folly and powerlessness as compared to the spiritual power of the Great Guru. He fell on the feet of Guru and humbly prayed to be pardoned. The Guru advised him to get rid of his wickedness and lead the life of a nobel person, in the service of humanity. This changed the life style of demon and he started serving the people. The Guru there after continued his Holy journey towards Srinagar and Kashmir via Kargil. Powerlessness as compared to the spiritual power of the Great Guru. He fell on the feet of Guru and humbly prayed to be pardoned. The Guru advised him to get rid of his wickedness and lead the life of a nobel person, in the service of humanity. This changed the life style of demon and he started serving the people. The Guru there after continued his Holy journey towards Srinagar and Kashmir via Kargil. The boulder having imprint of the Guru's back is lying in the Gurdwara to this day. CONFLENCE OF THE ZANSKAR & INDUS : On way to Sham Valley before Nimu village one can have this magnificent view of two rivers in wed-lock! In seasons they have different colors and flow and wildness. LADAKH HALL OF FAME : The Hall of Fame is a glorious museum constructed by the Indian Army. It is worth a visit for every citizen. You can see the memorabilia, eminent defense personalities with biographies, images and weapons used during the Kargil and other key strategic battles fought in Ladakh. And belongings of the enemy soldiers found at war site. All the martyr and the gallantry awards. Here's something that you will be proud of our defense personnel who sacrificed themselves so that we could live in peace. the ever-changing blues and greens of the lakes brackish water. Above Spangmik are the glacier and snow-capped peaks of the Pangong range. After breakfast prepare yourself for the ultimate adventure of your life. 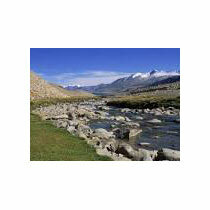 We will drive upto the Khardung la Top to have a magnificent view of the surrounding valleys. After spending some time there come back to Hotel and relax. Dinner and overnight at the hotel in Leh. KHARDUNG LA PASS: The road journey to Nubra valley leads through Khardung La pass (The highest Motorable road in the world) 18,390 ft. around 39 Kms. Away from Leh. There are two checkpoints on the both sides of the pass. Khardong is the first village of Nubra valley at higher altitude than Deskit and other villages. Morning after breakfast, drive to Thicksey village, visit Thicksey monastery and drive to Shey Village to visit Shey Palace and Gompa. Continue drive to Hemis monastery to visit one of the most famous monasteries of Ladakh. Later on the way back to Leh get down at the Sindhu Ghat for Sindhu Darshan and walk along the river. After spending some time at the river come back to Hotel and relax. Dinner and overnight at the hotel in Leh. THICKSEY GOMPA: 19 Kms from Leh, spectacularly sited, Thicksey is one of the largest and architecturally most impressive Gompa. There are several temples in this Gompa, containing images, stupas and wall paintings of Buddha, which are exquisite. SHEY PALACE AND GOMPA: Situated on a hillock 15 Kms upstream from Leh, it was once the residence of the royal family. According to tradition, it was the seat of power of the pre-Tibetan kinds. A 7.5 mts high copper statue of Buddha, plated with gold and the largest of its kind, is installed here. HEMIS GOMPA: 40 Kms from Leh, it is the wealthiest, best known and biggest Gompa of Ladakh. Its popularity stems from the major annual festival held here in summer. The festival is in honor of Guru Padma Sambhava's birth anniversary. It also has the largest Thanka in Ladakh which is unfurled once in 12 years Hemis was built in 1630 during the reign of Singge Namgyal, an illustrious ruler of Ladakh. It flourished under the Namgyal Dynasty for the royalty favored the Drugpa sect, which is managed the monastery. It is divided into two, the assembly hall on the right and the main temple on the left. The hall (Dukhang) is also used as "green room" by the dancers during the festival. The temple is known as Tshogkhang. The verandahs have a surfeit of frescoes, among them the Buddhist ?Wheel Of Life? (Kalachakra) and the lords of the four quarters, besides the prayer wheel. SINDHU GHAT: The Sindhu Ghat at Choglamsar village at the bank of River Indus has been inaugurated on the 1st of June 2001 by Hon'ble Minister for Home Shri L. K. Advani. Every year Sindhu festival is held on this bank of river, forges bonds of unity between communities. The festival is an ideal opportunity for travelers from all over the country and the world to visit this wonderful region and to savour its rugged beauty and charm. 02 Nd Child Between 5 - 12 Years Sharing Parent'S Bed Have To Pay Extra For Meals Only.